Black Downslope Shelf for Slatwall or Pegboard can transform your slatwall panels into an instant bookstore. These lightweight shelves are easy to install onto any existing wire grid panel or display. 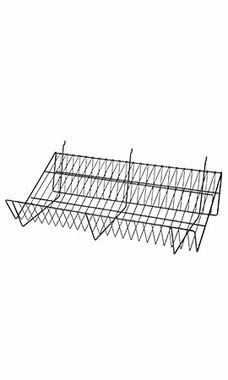 The shelf features include a black powder coat finish with an easy hook on attachment for installation. Additional features include a 4” slanted front lip that graduates to 12” height in the back.